Thanks to Dr. Rawia Mohamed, Sheikh Khalifa Medical City (United Arab Emirates) for contributing this case and discussion. To contribute a Case of the Week, follow the guidelines on our main Case of the Week page. 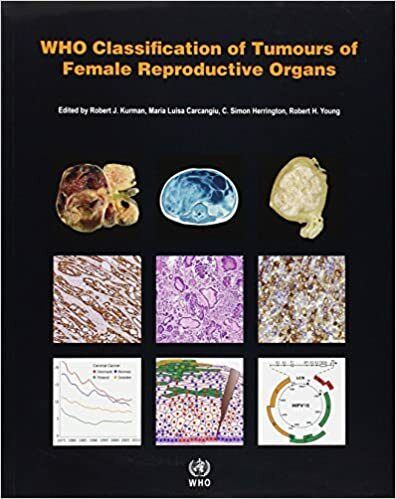 Top Books Listed on PathologyOutlines.com! Click here to view more Top Books listed on our site. (1) For August 2016, we had 490,000 total sessions, an all time high, as well as a record 15,806 sessions per day. Thanks again for your support. Current / recent improvements are faster website access and reduction of downtime, increasing the frequency of topic updates, continued conversion to our new template format (we are 20-25% complete) and expanded oversight by Editorial Board members. (2) For the first half of 2016, we contributed $745 to the Flint Child Health & Development Fund. This represents 10% of the funds we received because you shopped at Amazon.com through one of the Amazon links on our website (Amazon links can be found in the header / footer, on the Books pages, or just click on one of our Amazon banners). For the second half of 2016, we will contribute to the Detroit College Promise Scholarship program which we started, now part of the Detroit Public School Foundation. (3) Simply let us know what you think the coolest thing we could add to our website would be, and win a $50 Amazon.com gift certificate! Entering a contest has never been easier! Email us your idea or visit us at the upcoming CAP Las Vegas conference (Booth #217). One entry per person. PathologyOutlines.com staff will determine the winner (our decision is final, even if you disagree!). The winner must provide their name, affiliation or location, and email address and will be announced in our blog and emails. The deadline for submissions is September 30, 2016. A 4 year old boy presented with fever and recurrent abdominal pain for a few days. The pain was epigastric and colicky. There was no vomiting or weight loss. Blood work showed an elevated C reactive protein/CRP, but was otherwise unremarkable. Abdominal ultrasound and CT showed a large, irregular, lobulated, solid, hypo- to isoechoic lesion in the lower abdominal midline, 8.9 x 8.8 x 7.1 cm, which did not appear to arise from any specific organ. The mass was resected. 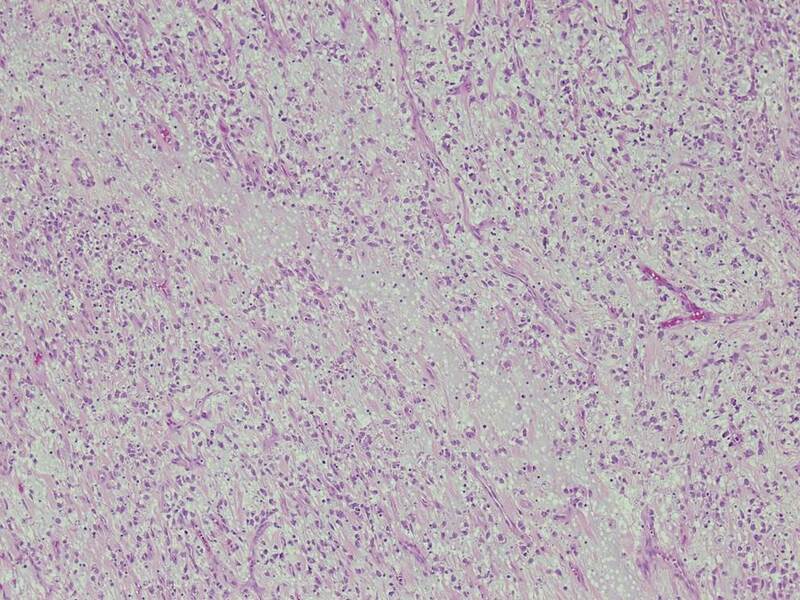 Inflammatory myofibroblastic tumor (IMT) is a rare mesenchymal neoplasm of children and adolescents, originally described in the lung, but subsequently reported in many extra-pulmonary sites. Extra-pulmonary tumors are most common in the omentum and mesentery, and tend to occur in older children with a slight female predominance (Goldblum: Enzinger and Weiss's Soft Tissue Tumors, 2013, 6th ed). IMT has borderline malignant potential with local recurrence in up to 25% of extra-pulmonary tumors, but only rare metastases (Am J Surg Pathol 2011;35:135). Patients are asymptomatic or present with pain and systemic symptoms such as fever, night sweats, weight loss and malaise. Elevated erythrocyte sedimentation rate/ESR, anemia, thrombocytosis and hypergammaglobulinemia may be present. The systemic symptoms typically resolve when the tumor is excised (Goldblum: Enzinger and Weiss's Soft Tissue Tumors, 2013, 6th ed). Grossly, IMTs are lobular, bosselated or multinodular; rarely there are separate nodules in close proximity. The microscopic appearance can be variable, with bland spindle or stellate cells arranged loosely or more compactly in a fascicular or storiform pattern. The stroma can be myxoid, hyaline or both. A lymphoplasmacytic infiltrate is characteristic, ranging from sparse to dense with well formed germinal centers. Neutrophils and eosinophils can also be present. Calcifications and metaplastic bone may be seen in areas with sclerotic scar-like stroma (Goldblum: Enzinger and Weiss's Soft Tissue Tumors, 2013, 6th ed). On IHC, IMTs are variably positive for myoid markers (SMA, MSA, desmin) and cytokeratin, but are EMA negative and usually S100 negative. 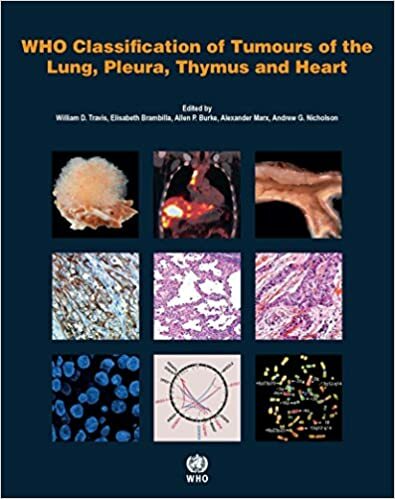 Approximately 50% have ALK gene rearrangement, and up to 60% show ALK positivity on immunostains (Dabbs: Diagnostic Immunohistochemistry: Theranostic and Genomic Applications, 2013, 4th ed, Goldblum: Enzinger and Weiss's Soft Tissue Tumors, 2013, 6th ed). 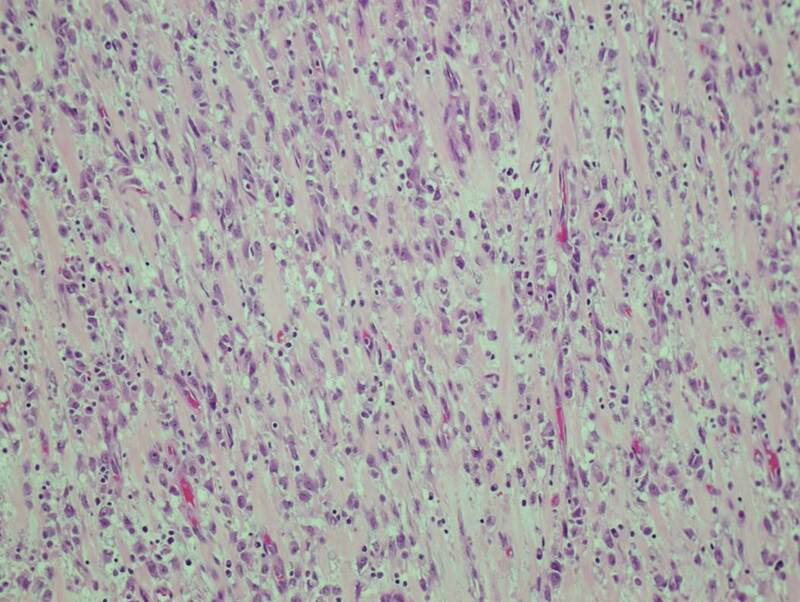 Epithelioid inflammatory myofibroblastic sarcoma (EIMS) is a rare, aggressive variant of IMT. 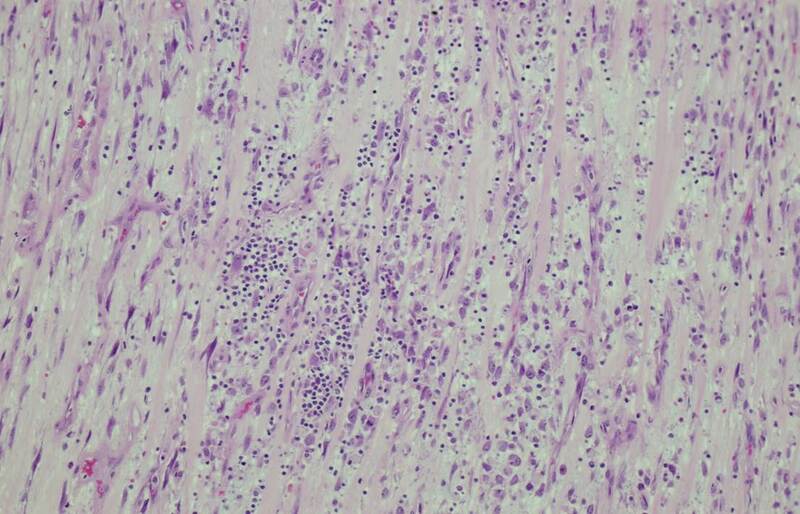 In general, histologic features of IMT such as tumor size, necrosis, mitotic activity and cytologic atypia do not correlate with malignant potential. However, the so called "round cell transformation" seen in EIMS does connote a more aggressive course, hence the use of "sarcoma" in its name. "Round cell transformation" refers to tumor cells with marked cytologic atypia resembling a ganglion cell or a Reed-Sternberg cell. The cells may be round or spindled, and the nuclei are vesicular with prominent nucleoli. Atypical mitotic forms may be present (Goldblum: Enzinger and Weiss's Soft Tissue Tumors, 2013, 6th ed, Am J Surg Pathol 2011;35:135). 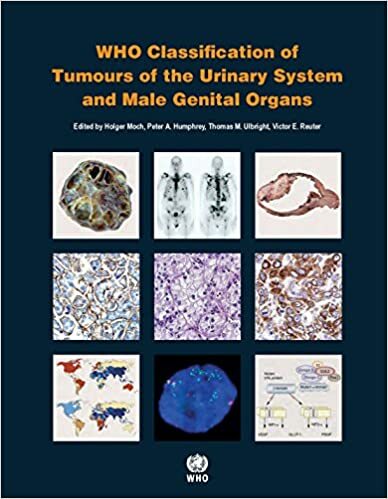 Interestingly, EIMS seems to occur almost exclusively in the abdomen, with a strong male predominance (Diagn Pathol 2016;11:67). 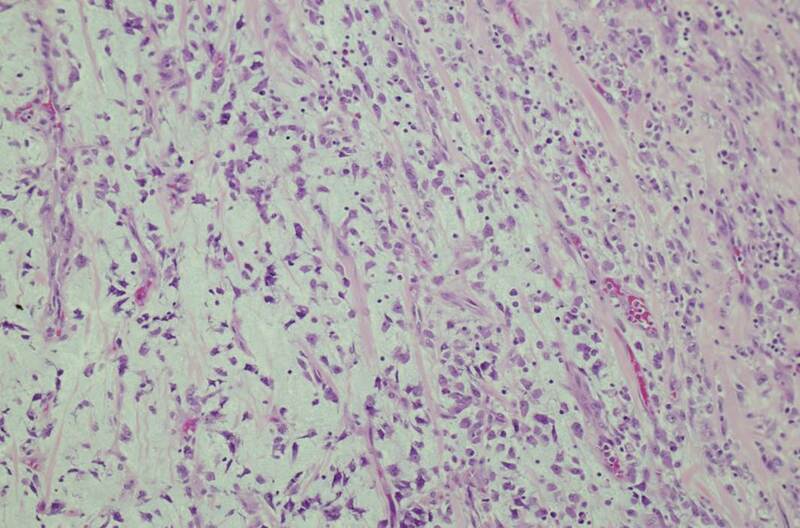 The tumors can have a prominent neutrophilic or eosinophilic infiltrate, and some may have no plasma cells. 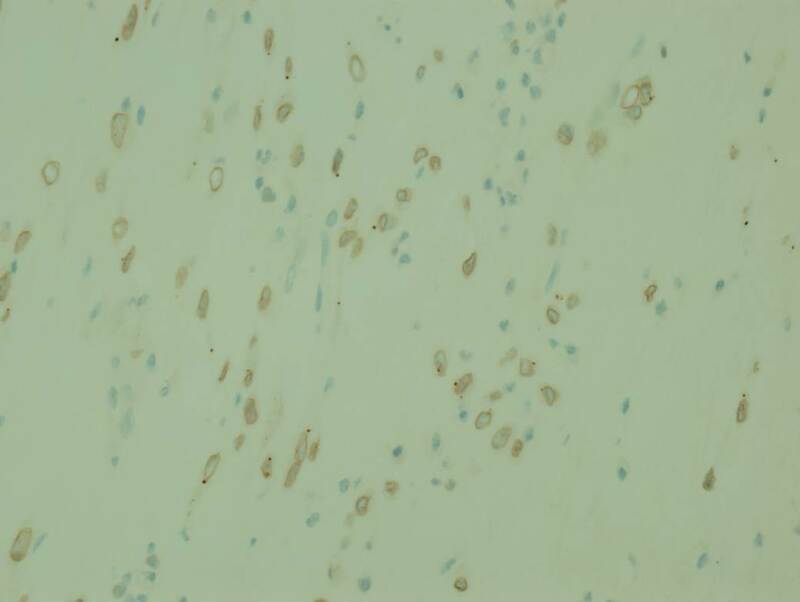 EIMS are more likely than IMTs to have desmin positivity, and tend to show a peculiar perinuclear staining pattern on ALK immunostains, which is well illustrated in this case. Most importantly, EIMS have a characteristic RANBP2-ALK fusion (Am J Surg Pathol 2011;35:135). The differential diagnosis for EIMS includes anaplastic large cell lymphoma, the solid variant of alveolar rhabdomyosarcoma, epithelioid leiomyosarcoma, dedifferentiated liposarcoma showing an "inflammatory MFH" pattern, epithelioid GIST, and extra-renal rhabdoid tumor. 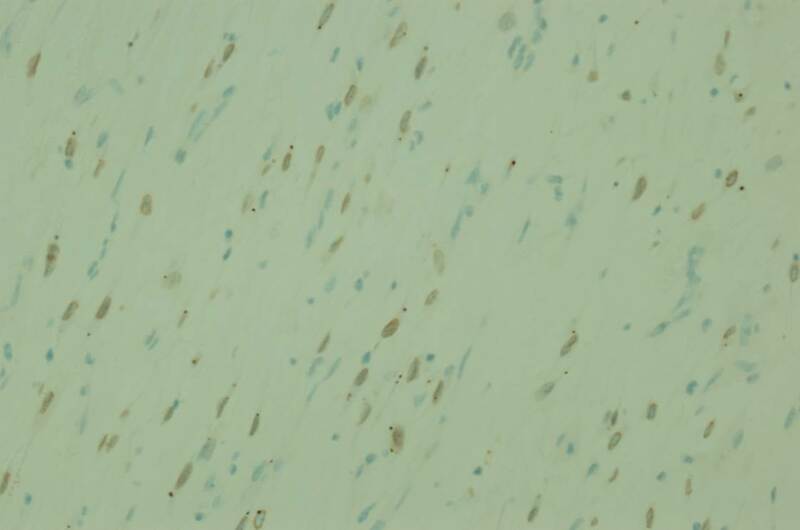 Immunostains can help with the diagnosis, although there is considerable overlap in staining patterns. For example, ALK positivity can be seen in several mesenchymal tumors, such as rhabdomyosarcoma, malignant peripheral nerve sheath tumor, leiomyosarcoma, Ewing sarcoma / peripheral neuroectodermal tumor, liposarcoma and alveolar soft parts sarcoma. 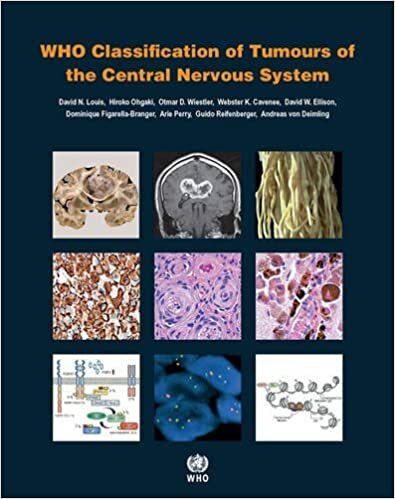 However, these tumors should have cytoplasmic positivity for ALK; finding a perinuclear staining pattern or a RANBP2-ALK fusion would reinforce the diagnosis of EIMS (Diagn Pathol 2016;11:67, Oncol Rep 2015;33:1667). For this particular case, the immunophenotype showed positive staining for SMA, desmin, CD99 and INI1, with nuclear membrane staining for ALK. Negative staining was seen for c-KIT, CD34, myogenin, myoD1. RANBP2-ALK fusion was detected by FISH. EIMS can be very aggressive, with 8 of 21 reported patients dying of disease within 3 years of diagnosis (Oncol Rep 2015;33:1667). Treatment with ALK inhibitors is being investigated and some patients have had good responses (Oncol Rep 2015;33:1667, Am J Surg Pathol 2011;35:135).